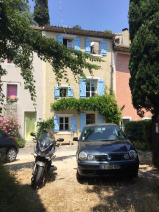 Beautiful townhouse by the foot of Mont Ventoux, Malaucene, France. The architects own new-built well isolatet townhouse in a little middelage-town in the wonderful Provence, France. 90 m2 in tree floors. The house is placed in the old part of the town and is architectonic carefully adaptet to the other houses. The house contains studio-room with open fireplace and opening out to the balcony and mountain-terrace. The bedroom has build-in wardrobes, make-up place and fireplace. 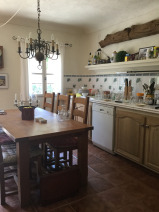 Big provence-kitchen containing dining-table and open grill. Beautyful bathroom containing bath-tub, washbowl, toilet and bidet. The house is well-equiped: el-cooker, refrigerator with freezer, dishwasher, washing machine, el-heating, elevation-beds. In the sitting-room: bed-settee and an open "mezzanine" (bed loft). All furnitures, domestic utensils and so on are enclosed, just to move in. There are no duty to live full time bound to the house and when you leave for a longer period you just close the house with shutters. You can see the house after previously arrangement. The house will be open for visitors : 11. - 12. december 2018.